Following the very dominant display from Ralf Schumacher and Williams on Sunday, there has been a distinct rise in the stock of the team along the pitlane. The writing was on the wall in Brazil, when Juan Montoya led strongly for much of the race, whilst Ralf lapped significantly quicker than the remainder of the field despite being four laps down: pundits leapt to the take up the marker, and predict a win this year. Not many thought Imola would be the proving ground. At the front, however, there is concern. Ferrari have � uncharacteristically � made a couple of poor strategic choices that have not worked out in the last two races. Some of their "missing" race pace, therefor, can be accounted for here; however, there was no arguing that the Williams package was the one to have on Sunday. McLaren, on the other hand, have targeted improvements and brought them on board. When setting the pole time on Saturday, David Coulthard was still not totally confident in his car; it's good, but not quite there yet. Forthcoming developments are expected to continue evolving the balance of the car. This in turn improves driver confidence, and they can attack the corners better � so there is a clear development path visible to the team. However, thanks to Michelin's involvement, neither front runner has been able to work out precisely where the Williams advantage lay. Clearly, the new front tyre was a significant plus � front end grip for Williams had some complaints at the start of the season, as with most Bridgestone runners, but the problem seems to have been dialled out over the last two races. However, that is insufficient to explain everything � Jaguar had the same tyres, and were still nowhere. The implication is that Williams have put together another exceptional package. The BMW engine is powerful, probably generating the most grunt in the pitlane, and the chassis has to be pretty impressive too. Problems with traction � related to missing rear downforce � have been resolved, allowing full use of the engine. Problems with turn-in � related to missing front grip � have been resolved by working with Michelin and evolving the front aerodynamics... and now the team have a package that can not only challenge for race wins, but will dominate events if the competition is not on the ball. Being a fickle sport, there has been some talk of the big two moving to Michelin � the new tyre is a winner in only four races, after all. But despite this, neither is expected to make the jump. A move would not bring the favourable status that Williams currently enjoy with their provider; and without having a tyre that is tailored to their suspension, remaining on Bridgestone rubber, and working directly with their engineers, is due to remain favourite for some time to come. Whilst not wishing to admit they are being pushed by their new competition, Bridgestone are starting to feel the pinch of working flat out to stay on top of their French challenger. At the San Marino Grand Prix, McLaren's David Coulthard and Jordan's Jarno Trulli both struggled on their second sets of tyres, which were inconsistent. 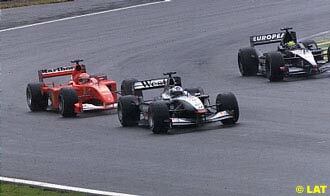 Tarso Marques lost pressure in his front right, and Michael Schumacher failed to finish after a punctured front left. It's an accepted facet of the sport that the tyres will have a small difference between sets. The manufacturing process includes some manual elements, and inevitably, there are going to be some slight differences between any two supposedly identical tyres. However, the number of problems experienced by Bridgestone users, in contrast to their Michelin running counterparts, highlights the pressure Bridgestone are coming under to develop new products, then produce consistent tyres for all the teams they support. 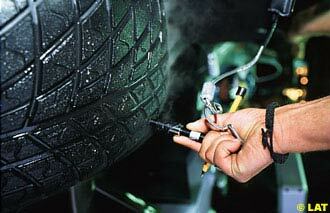 Michelin's win is only expected to increase the pressure on Bridgestone. On entering the sport, fighting Goodyear, the Japanese giant signed up McLaren and Benetton, is the full expectation of being able to work with both when developing their new rubber. As it turned out, McLaren started out noticeably the stronger; so when push came to shove, the development focus pulled firmly in the Woking team's favour: Benetton were very bitter after wasting development effort revising their suspension to use the wider tyres they asked Bridgestone for, only to discover McLaren's preferred rubber was to be used instead. This time around, Bridgestone is determined to maintain their relationship with both McLaren and Ferrari. Meeting the development requirements of both teams is a stern challenge, even without problems in product control; but as the pace of change increases, the need to maintain a firm grasp on the standard of the tyre stock taken to races is paramount. 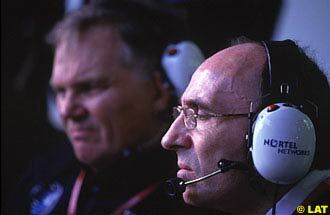 Whilst the FIA consider their changes for the 2001 season a failure in terms of slowing the cars down properly, the general consensus is that the racing action is closer � helping to improve a situation that has brought the governing body under fire in the past. There was some question whether the FIA's changes would make the difference. For some time, pundits have been making the case for cutting downforce, and particularly decreasing the problem of a car following another through a high speed corner losing front downforce. However, it has long been recognised that the bigger the changes made, the more the teams are spread out, as those with the biggest budgets adapt fastest. In designing cars for this year, there have been a number of complaints that the changes (for the improved safety requirements) have required a significantly different approach. However, the aerodynamic and mechanical approaches to meet the new dimension restrictions have been sufficiently close to last year's that teams have been able to substantially follow on their research efforts � well enough to avoid going backwards on last season, and largely make a strong step forward. It is too early in the season to know how much of the increased action is due to the FIA's judicious pruning of aerodynamics, and how much relates to having two damp races in the four openers. However, one thing that is immediately apparent, there have been passes for the lead already this season, and with a third team coming to the fore, there is a serious prospect for more.